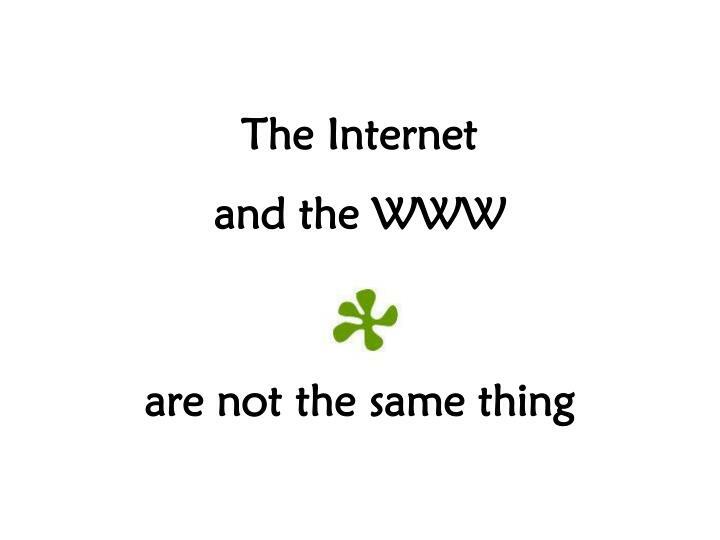 The Internet is a massive network of networks.It connects millions of computers together globally, forming a network in which any computer can communicate with any other computer as long as they are both connected to the Internet. 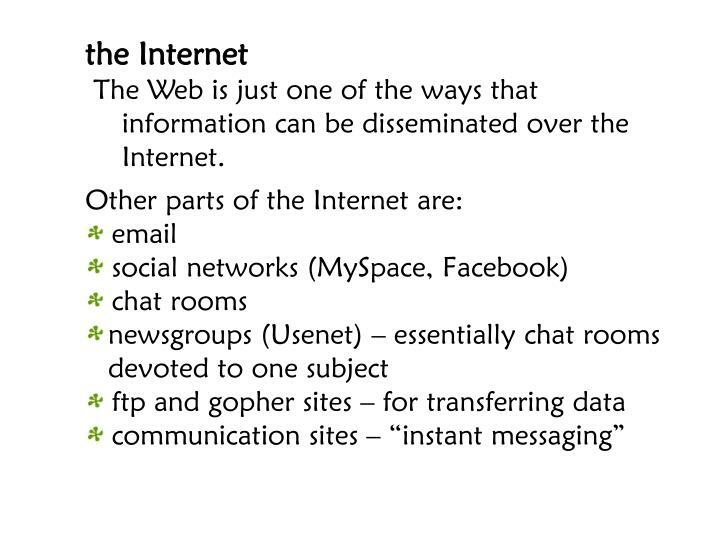 Information that travels over the Internet does so via a variety of languages known as protocols. 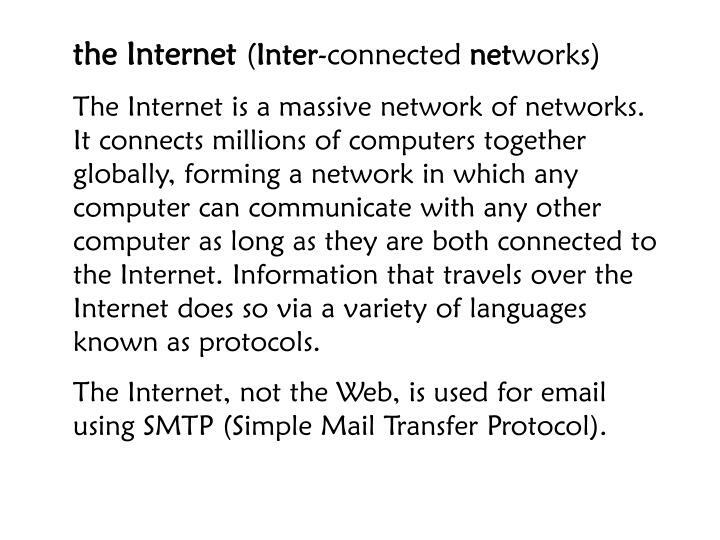 The Internet, not the Web, is used for email using SMTP (Simple Mail Transfer Protocol). 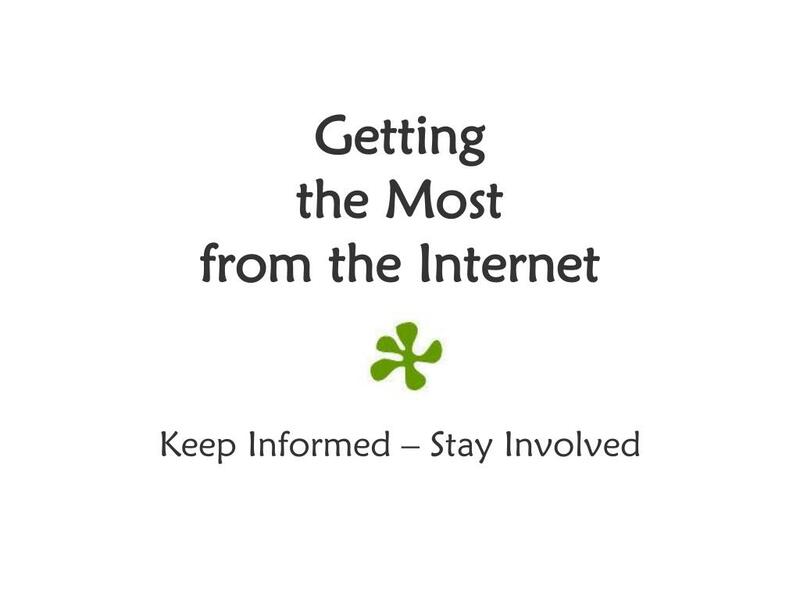 The Web is just one of the ways that information can be disseminated over the Internet. 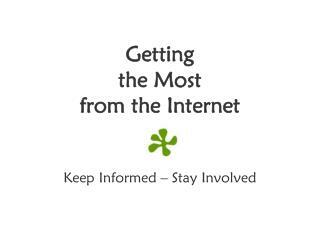 is a way of accessing information over the medium of the Internet. 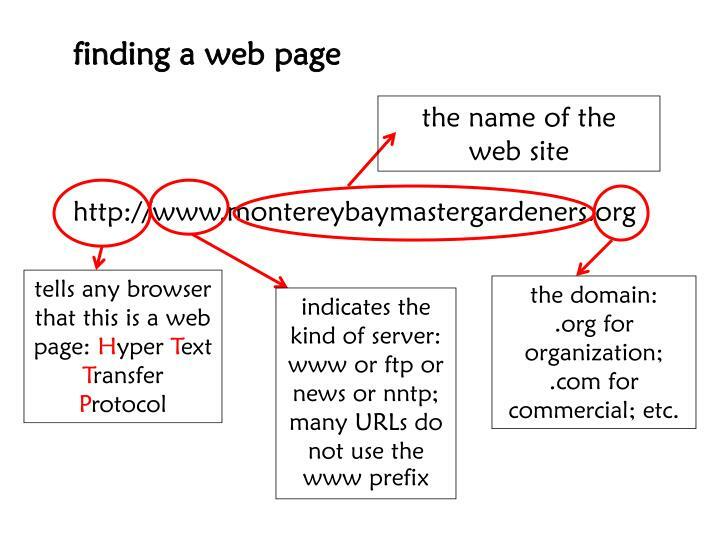 It uses HTTP (Hyper Text Transfer Protocol), one of the languages spoken over the Internet, to transmit data. 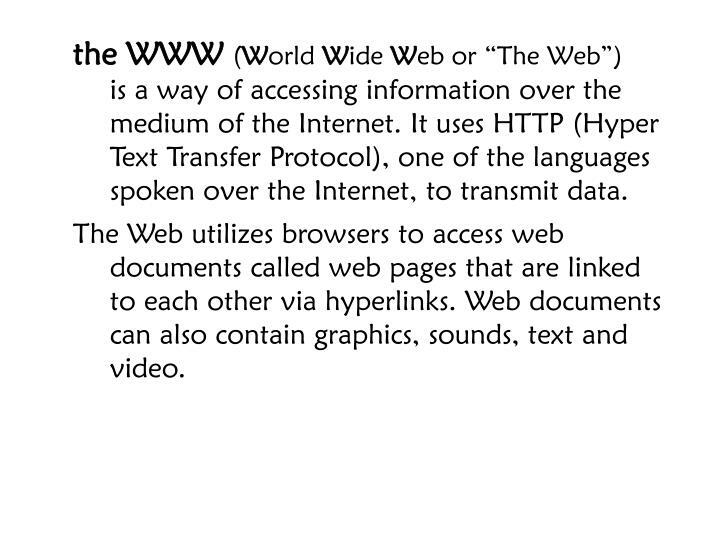 The Web utilizes browsers to access web documents called web pages that are linked to each other via hyperlinks. 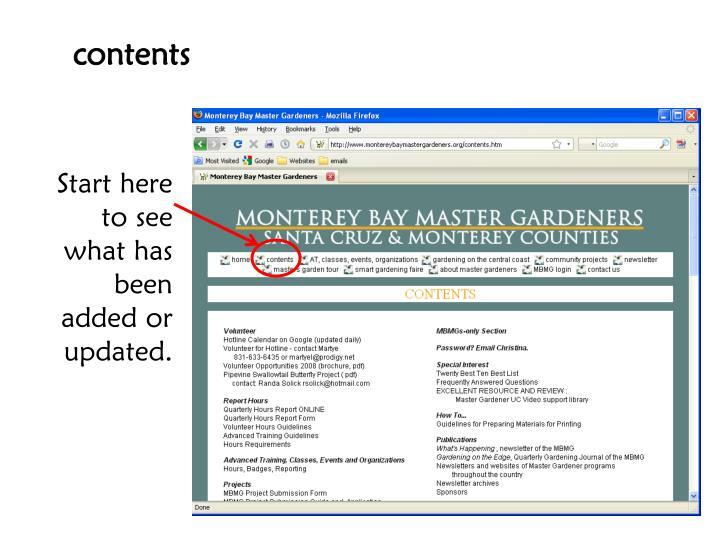 Web documents can also contain graphics, sounds, text and video. 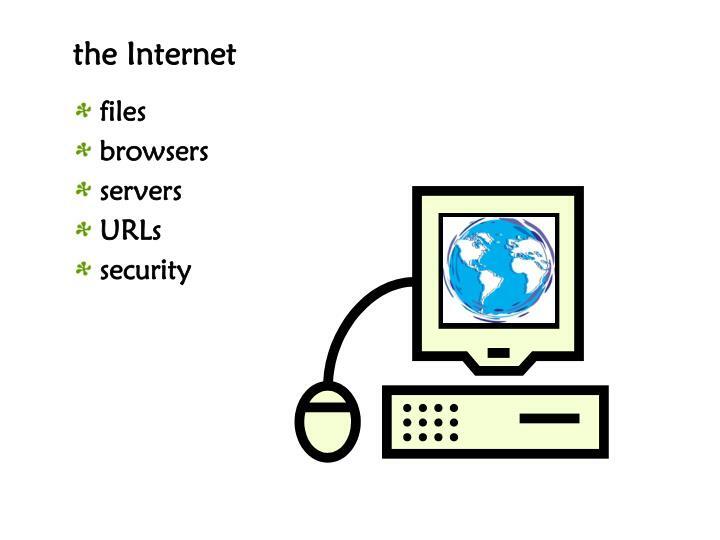 Each computer that is connected to the Internet is identified by an individual IP (Internet Protocol) address like “208.233.88.55.” This enables computers to locate each other. 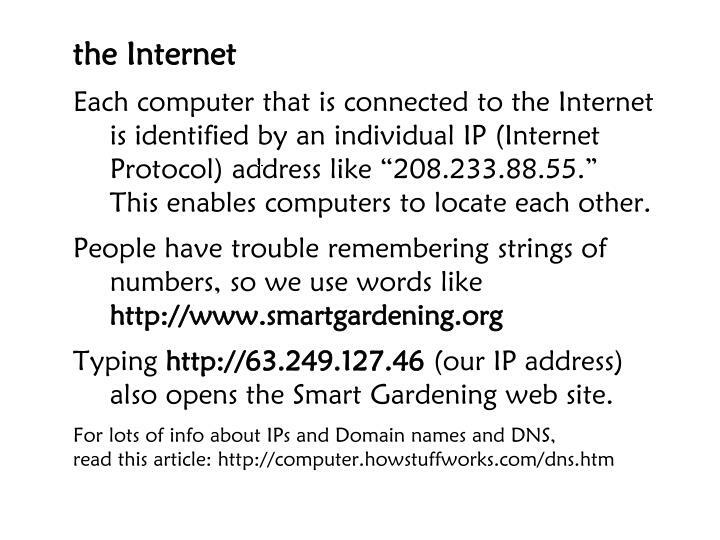 Typing http://63.249.127.46 (our IP address) also opens the Smart Gardening web site. As you can see, the Internet, the WWW and all the software that runs on your computer operate on systems of rules. 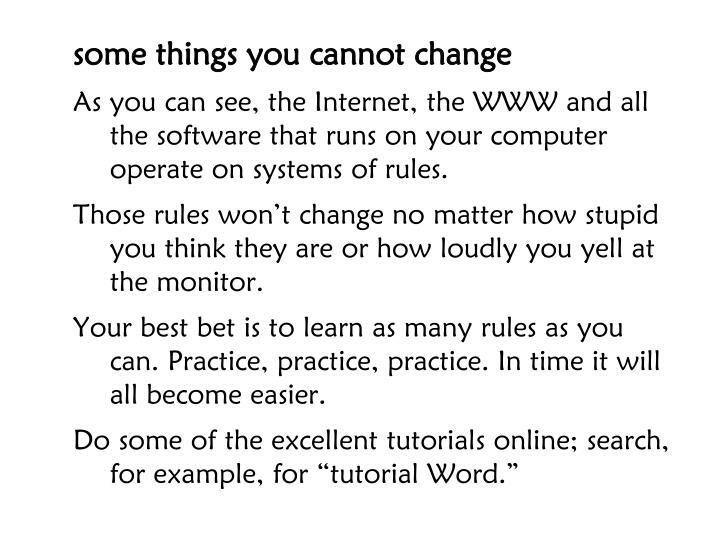 Those rules won’t change no matter how stupid you think they are or how loudly you yell at the monitor. Your best bet is to learn as many rules as you can. Practice, practice, practice. In time it will all become easier. 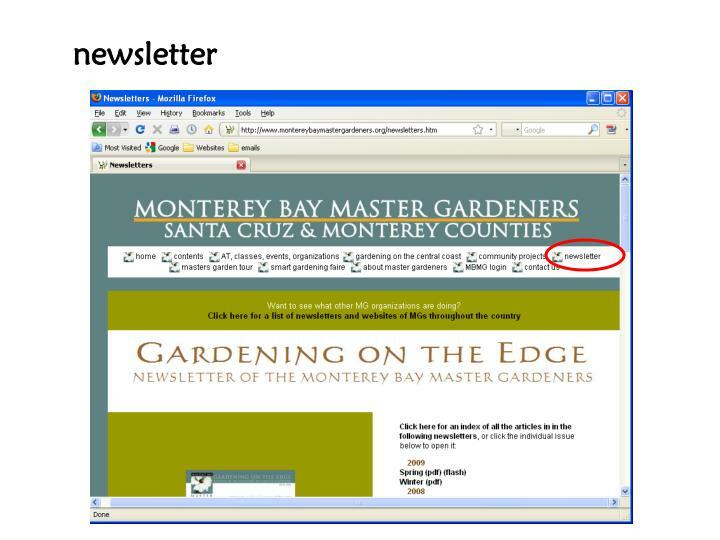 An email without images is one file. An image is one file. 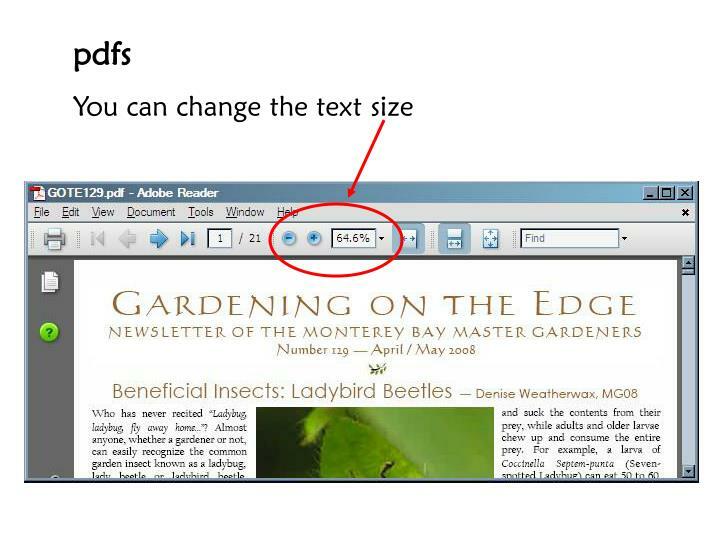 A Word document is one file. A song on your mp3 player is one file. 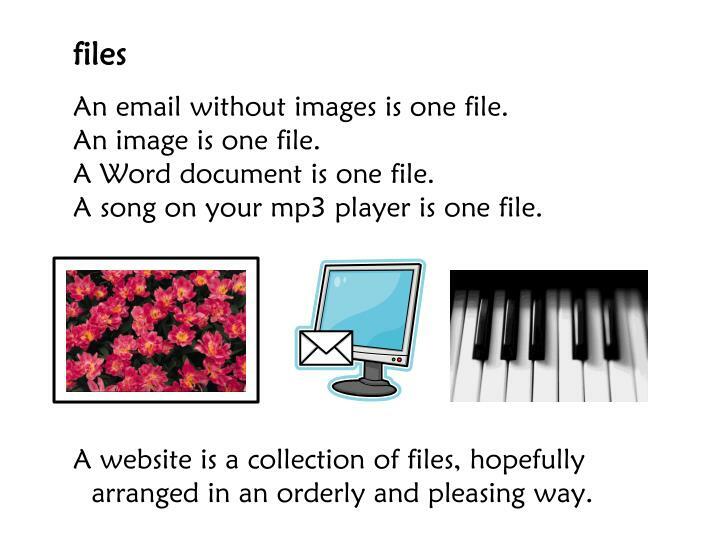 A website is a collection of files, hopefully arranged in an orderly and pleasing way. A browser (aka a GUI or Graphical User Interface) is a program like Safari, Google, Netscape, AOL, Internet Explorer or Firefox that displays your web pages and allows you to interact with them. 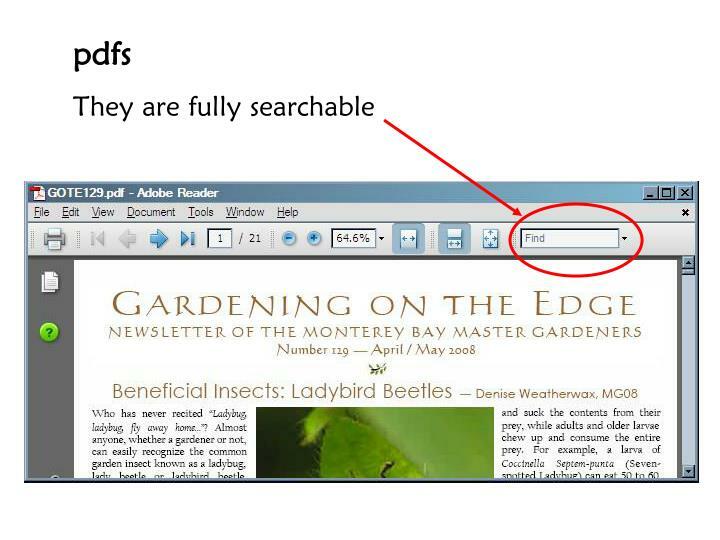 Browsers do not display web pages the same way, so one page can look surprisingly different on each browser – and on each computer monitor – and on Macs and PCs. 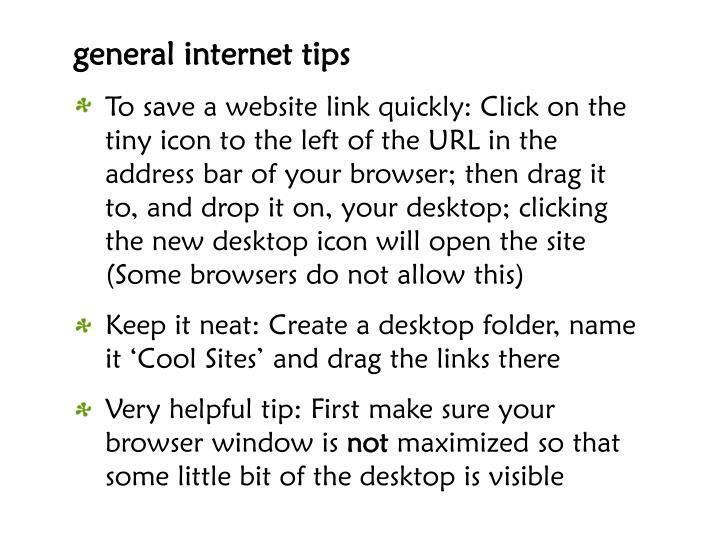 Your browser is your friend. 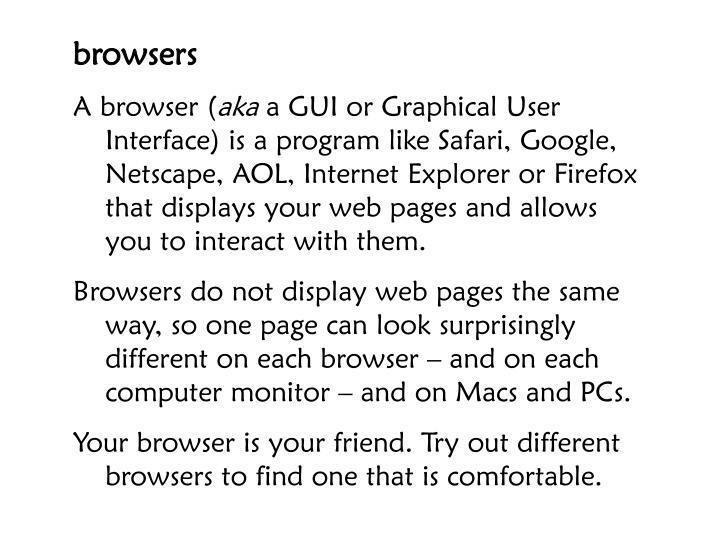 Try out different browsers to find one that is comfortable. 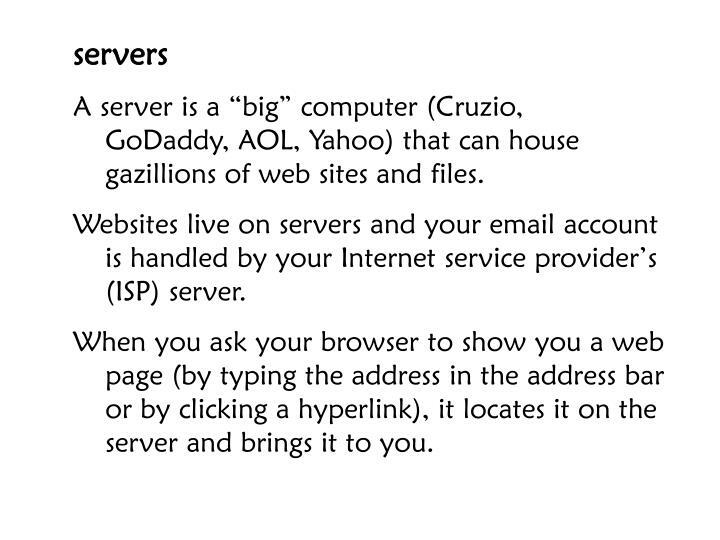 A server is a “big” computer (Cruzio, GoDaddy, AOL, Yahoo) that can house gazillions of web sites and files. Websites live on servers and your email account is handled by your Internet service provider’s (ISP) server. 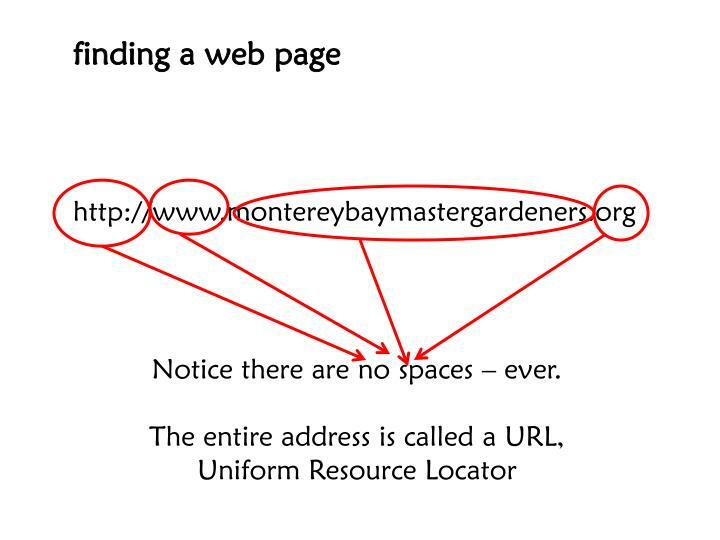 When you ask your browser to show you a web page (by typing the address in the address bar or by clicking a hyperlink), it locates it on the server and brings it to you. 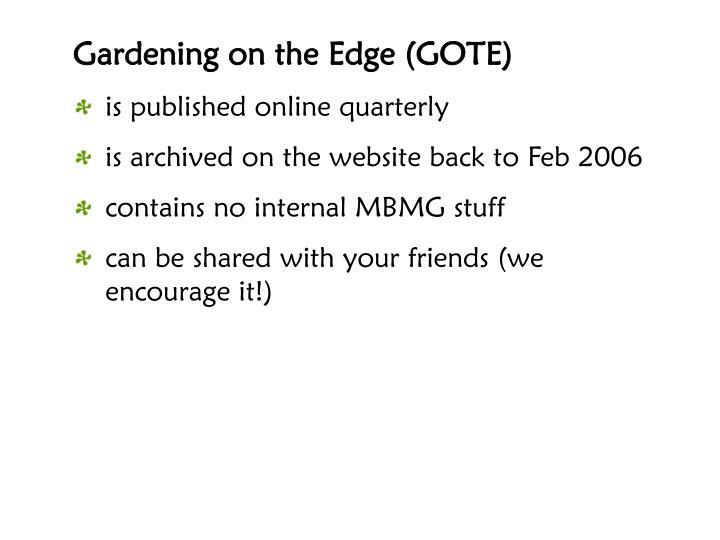 the domain: .org for organization; .com for commercial; etc. Notice there are no spaces – ever. 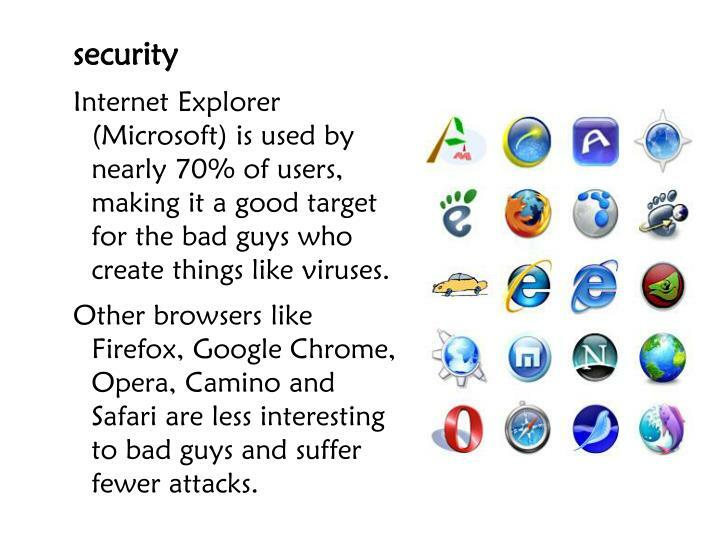 Internet Explorer (Microsoft) is used by nearly 70% of users, making it a good target for the bad guys who create things like viruses. Other browsers like Firefox, Google Chrome, Opera, Camino and Safari are less interesting to bad guys and suffer fewer attacks. 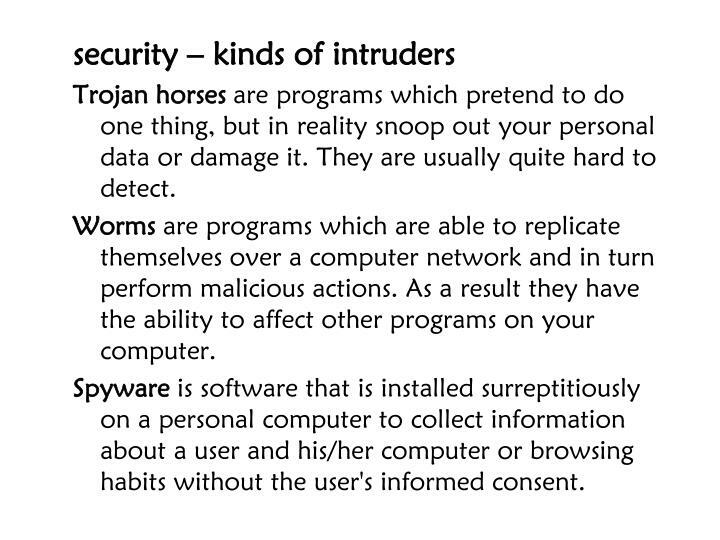 Trojan horses are programs which pretend to do one thing, but in reality snoop out your personal data or damage it. They are usually quite hard to detect. Worms are programs which are able to replicate themselves over a computer network and in turn perform malicious actions. As a result they have the ability to affect other programs on your computer. Spyware is software that is installed surreptitiously on a personal computer to collect information about a user and his/her computer or browsing habits without the user's informed consent. Viruses are programs which are able to log into the personal files on a computer and can actually remove or alter them. 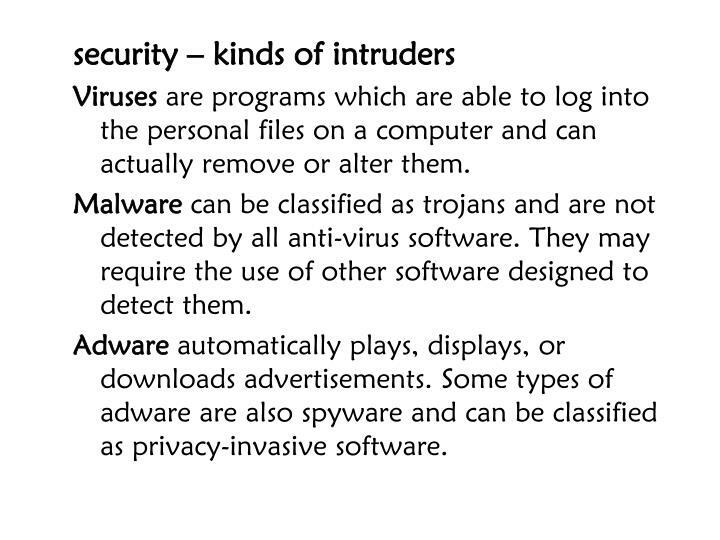 Malware can be classified as trojans and are not detected by all anti-virus software. They may require the use of other software designed to detect them. 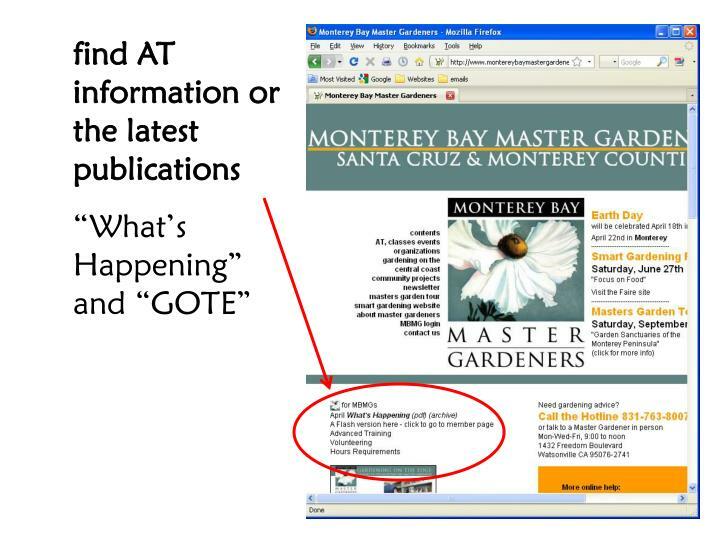 Adware automatically plays, displays, or downloads advertisements. 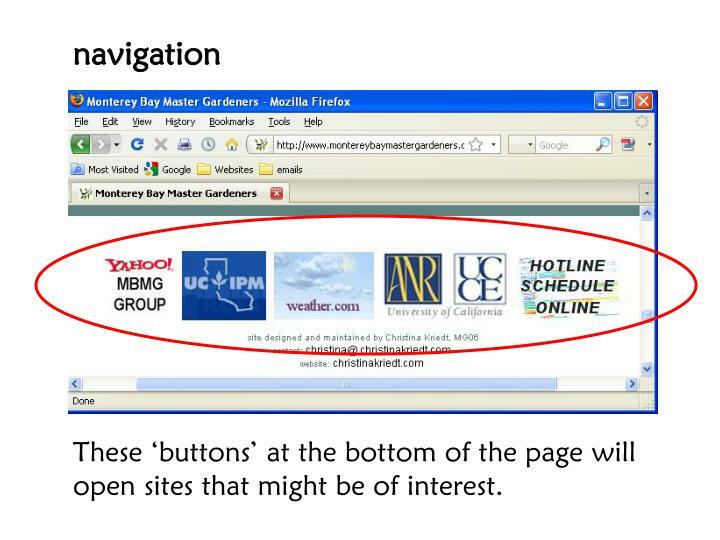 Some types of adware are also spyware and can be classified as privacy-invasive software. and tossing salt over your left shoulder with your eyes closed while standing on your right foot in Birkenstocks on a full moon at midnight on the second Tuesday of every other month. Just kidding. When you visit a web site it might place a unique ID (cookie) on your hard drive. 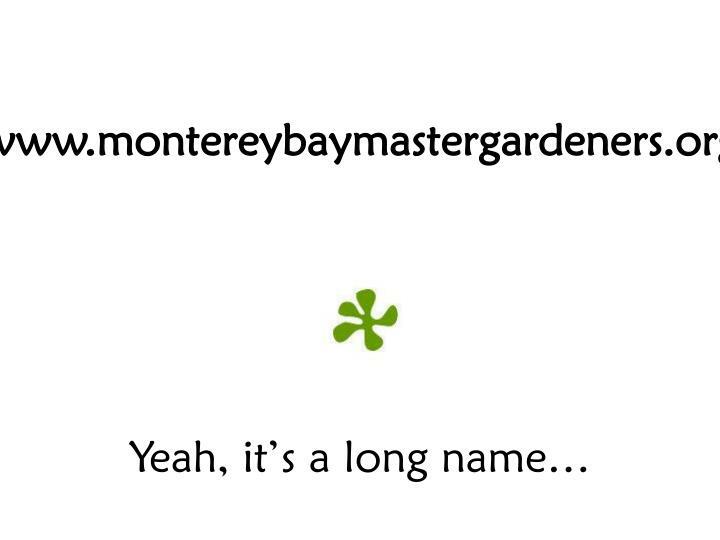 The next time you visit, the site will remember you. Are cookies dangerous? No. 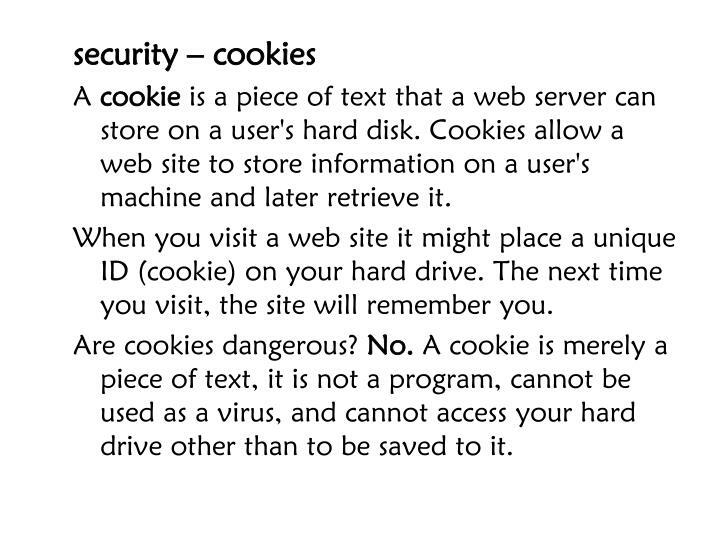 A cookie is merely a piece of text, it is not a program, cannot be used as a virus, and cannot access your hard drive other than to be saved to it. 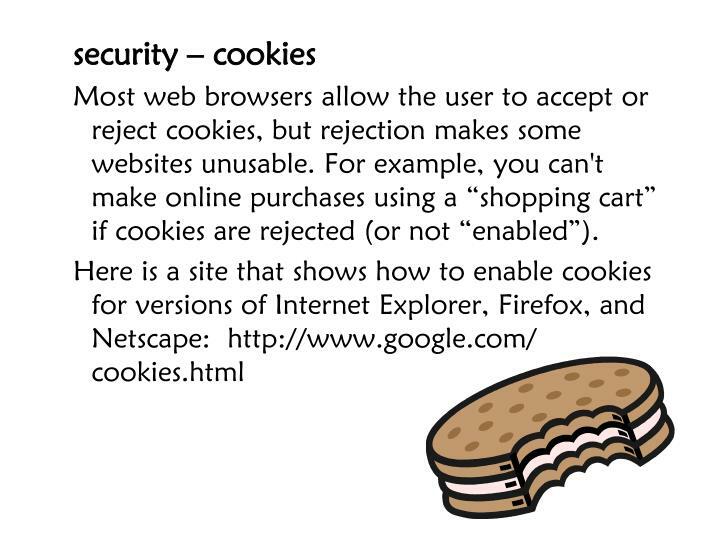 Most web browsers allow the user to accept or reject cookies, but rejection makes some websites unusable. 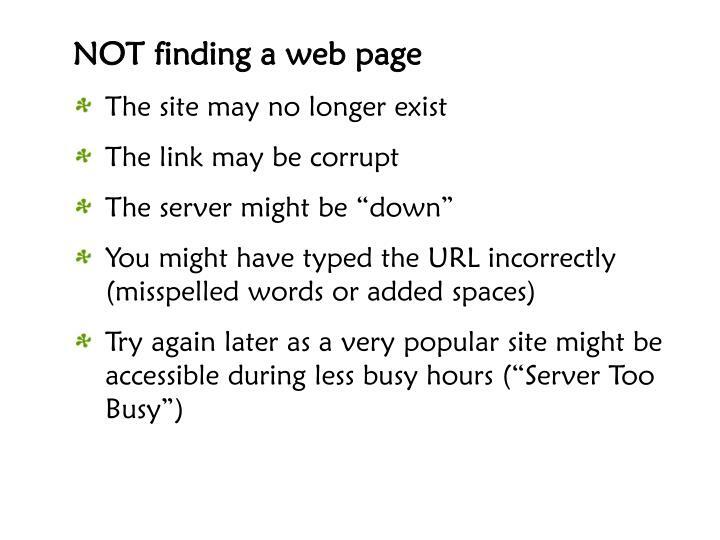 For example, you can't make online purchases using a “shopping cart” if cookies are rejected (or not “enabled”). 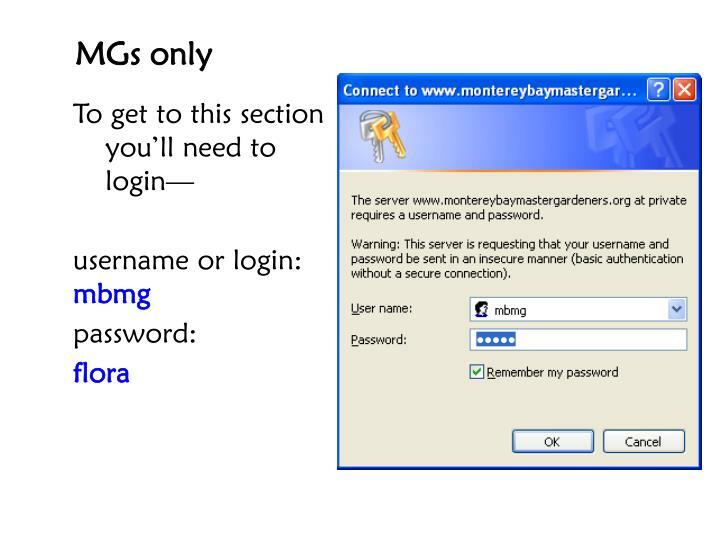 To save the link to the MBMG site, click on this icon and drag it to your desktop (some browsers like Opera do not allow this). 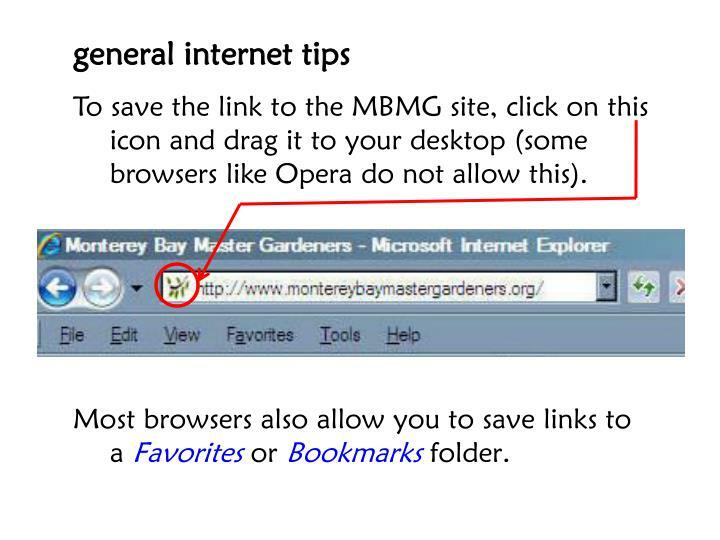 Most browsers also allow you to save links to a Favorites or Bookmarks folder. 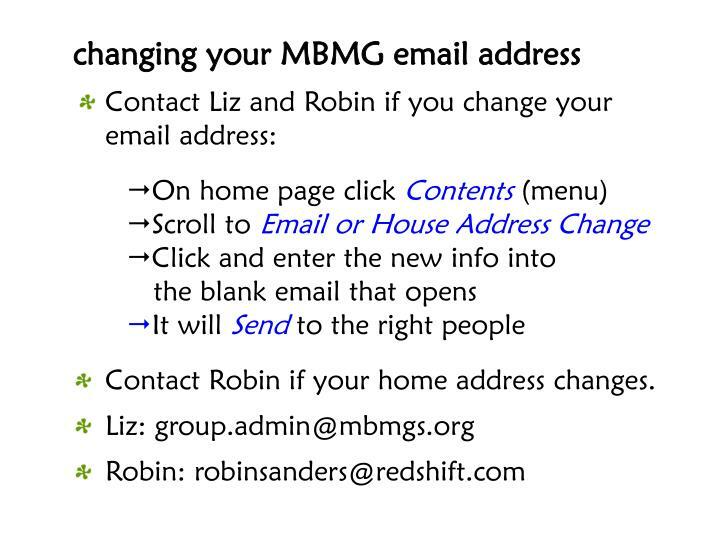 Contact Robin if your home address changes. 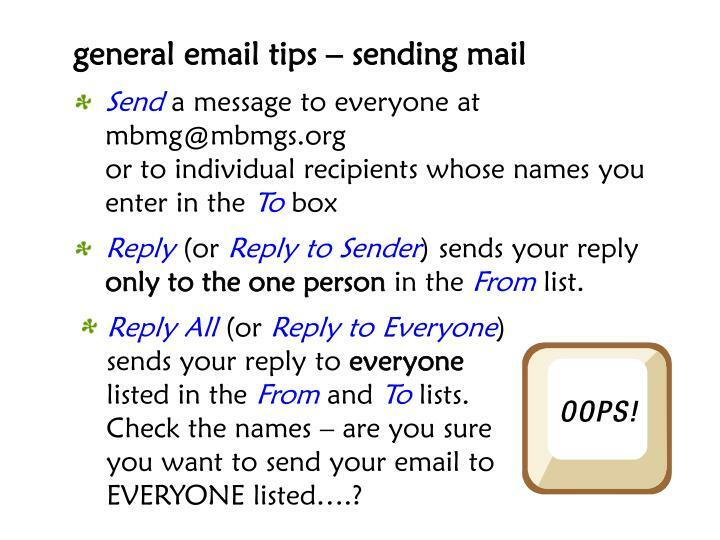 Reply (or Replyto Sender) sends your reply only to the one person in the From list. Reply All (or Reply toEveryone) sends your reply to everyone listed in the From and To lists. 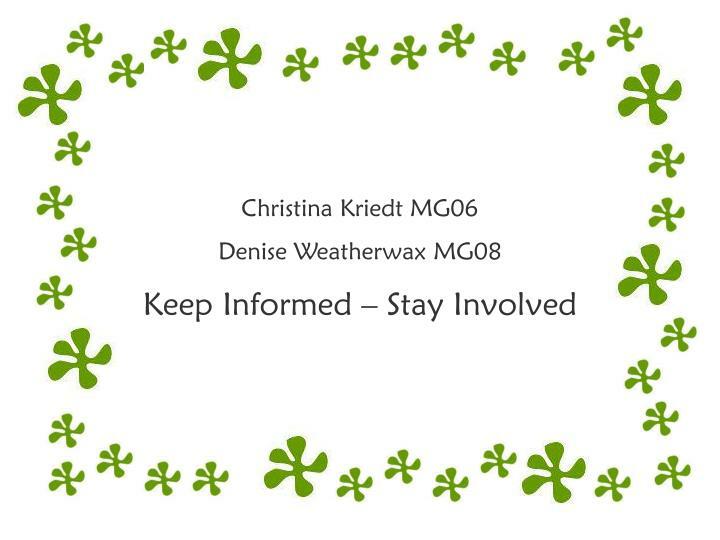 Check the names – are you sure you want to send your email to EVERYONE listed….? 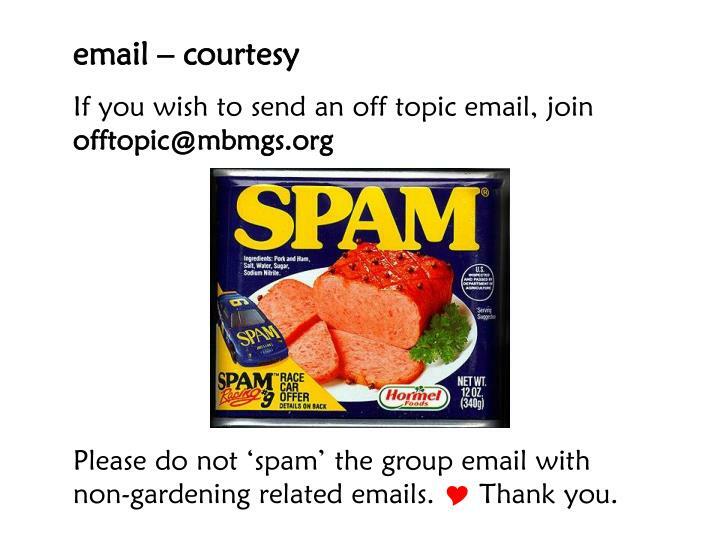 Please do not ‘spam’ the group email with non-gardening related emails.  Thank you. It is possible to fill up your mailbox. 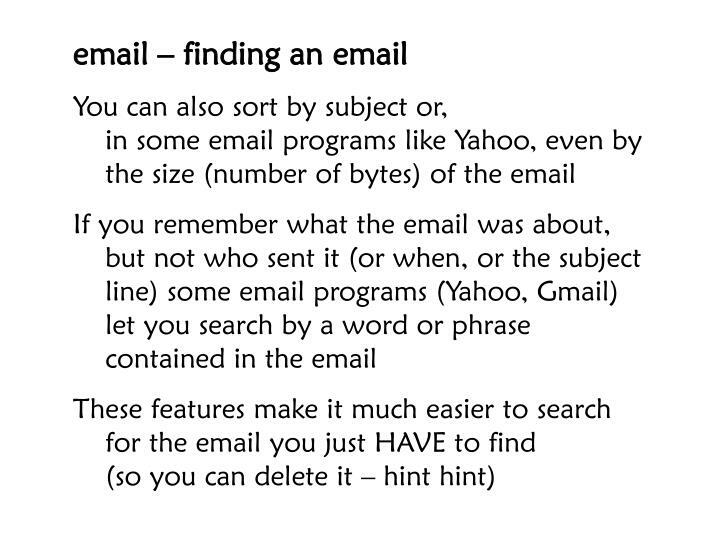 Any new emails that arrive when your mailbox is full will “bounce” back to the sender. That means you won’t receive them. 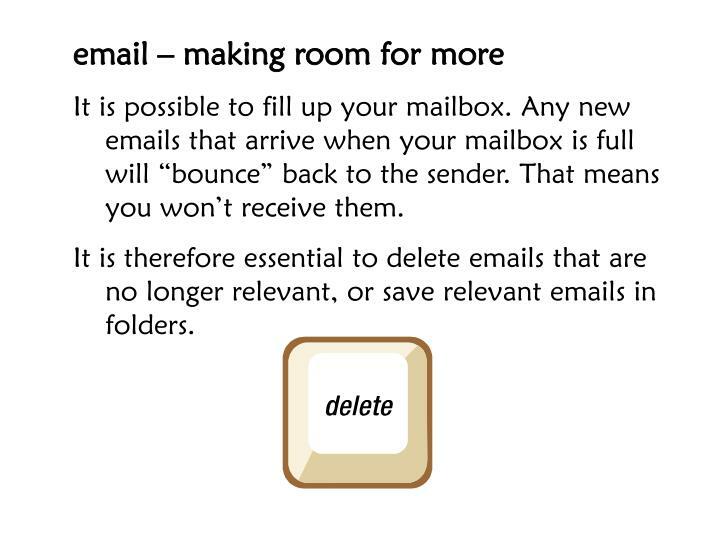 It is therefore essential to delete emails that are no longer relevant, or save relevant emails in folders. 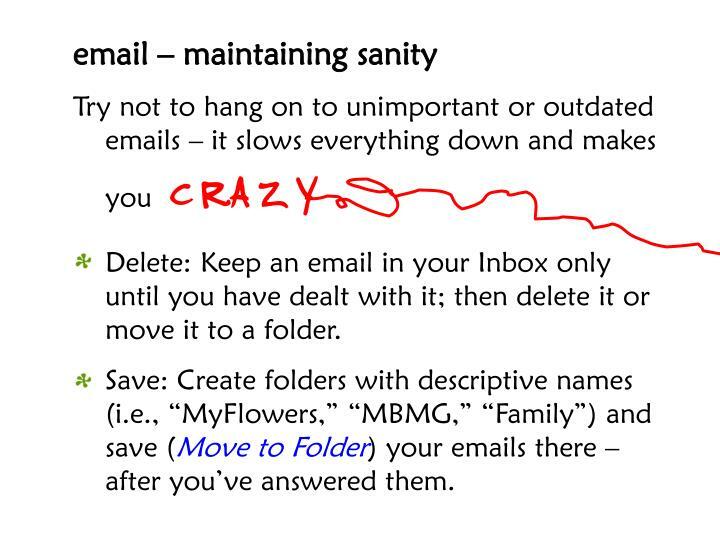 To remind yourself to revisit an email that requires attention, mark it as Unread. 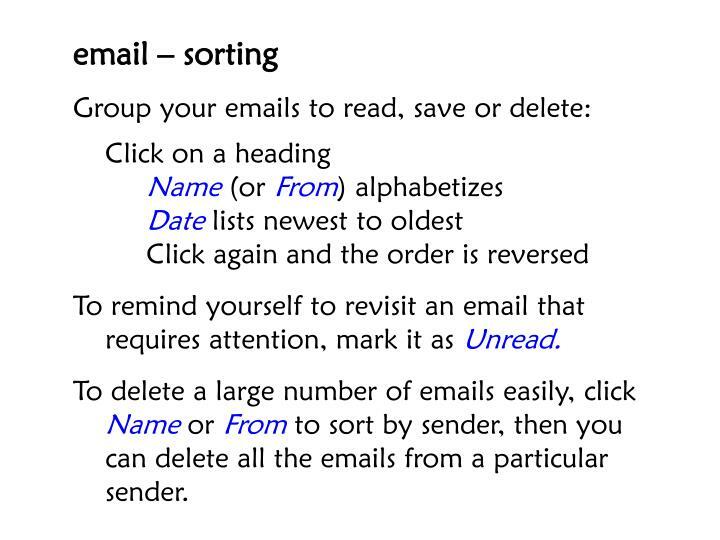 To delete a large number of emails easily, click Name or From to sort by sender, then you can delete all the emails from a particular sender. 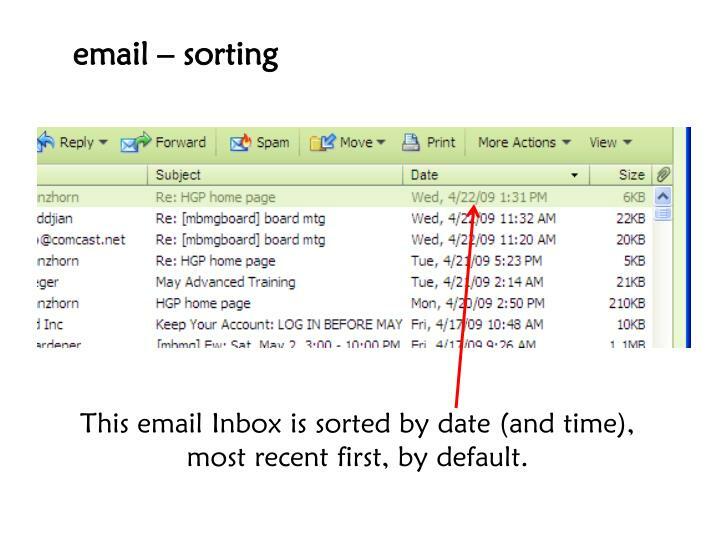 This email Inbox is sorted by date (and time), most recent first, by default. 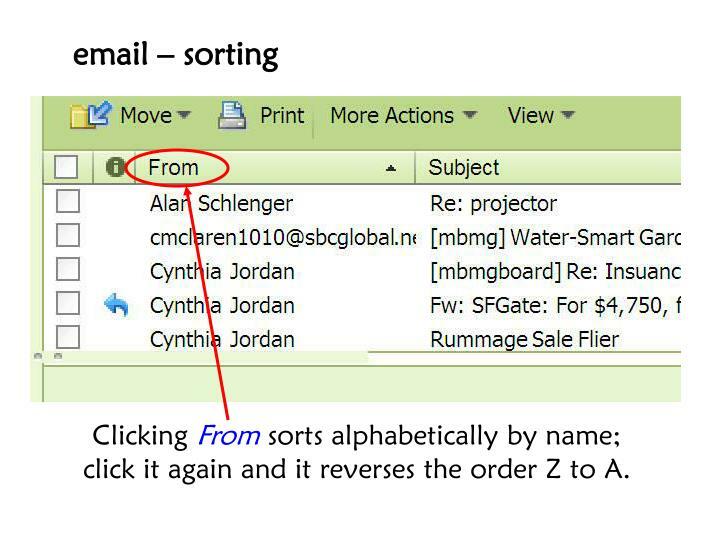 Clicking From sorts alphabetically by name; click it again and it reverses the order Z to A.
Delete: Keep an email in your Inbox only until you have dealt with it; then delete it or move it to a folder. 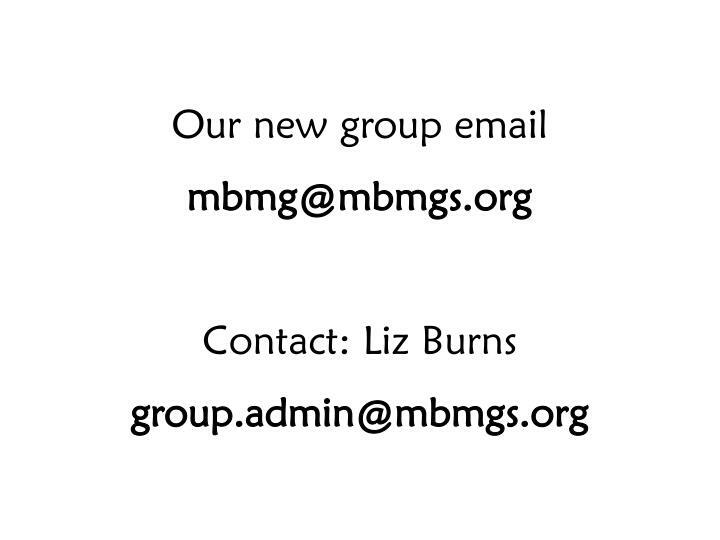 Save: Create folders with descriptive names (i.e., “MyFlowers,” “MBMG,” “Family”) and save (Move to Folder) your emails there – after you’ve answered them. 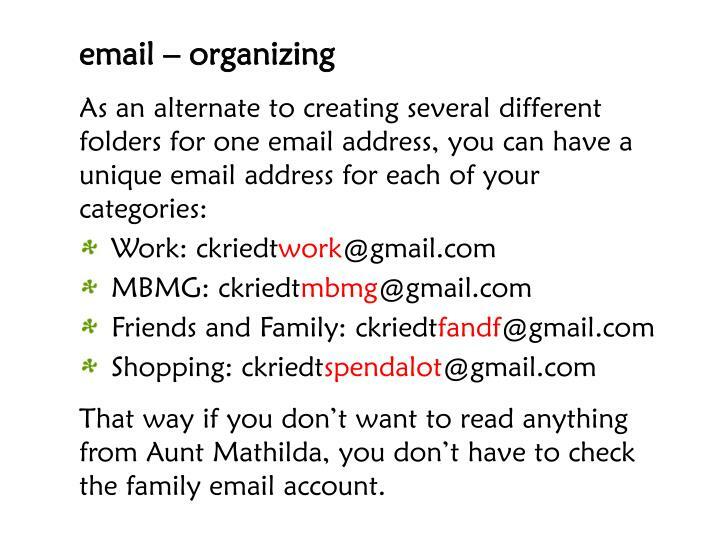 That way if you don’t want to read anything from Aunt Mathilda, you don’t have to check the family email account. 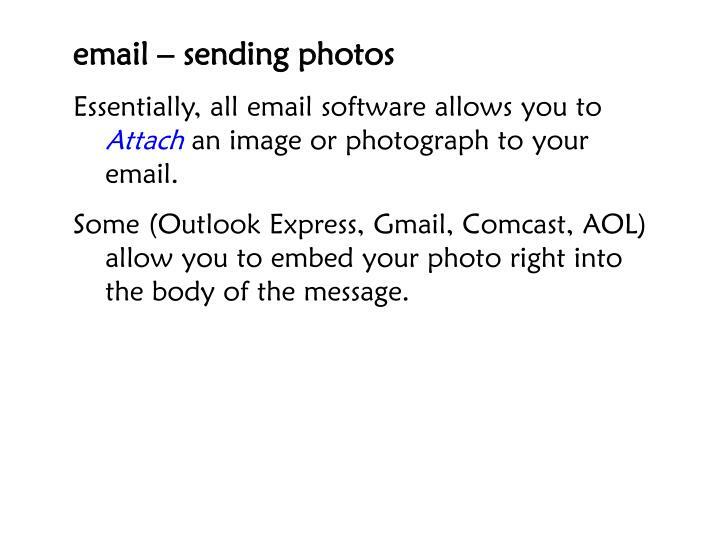 Essentially, all email software allows you to Attach an image or photograph to your email. 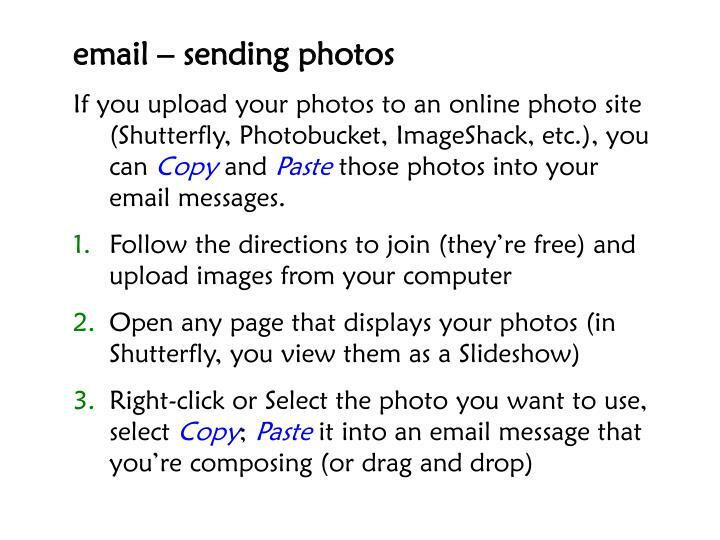 Some (Outlook Express, Gmail, Comcast, AOL) allow you to embed your photo right into the body of the message. 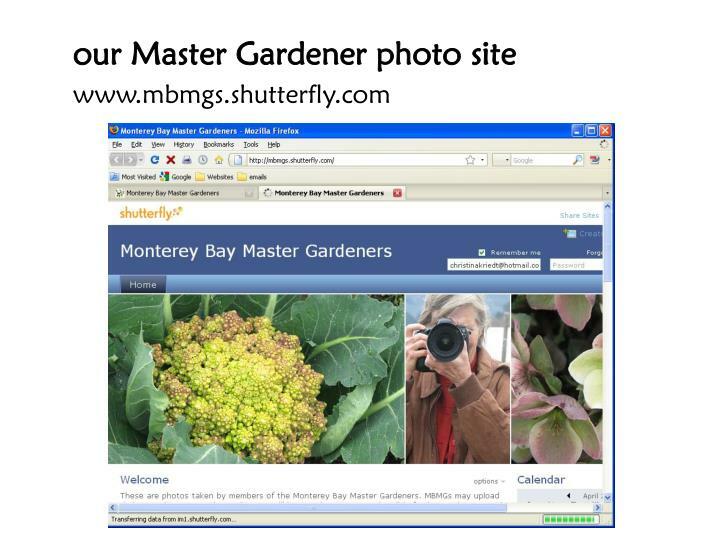 If you upload your photos to an online photo site (Shutterfly, Photobucket, ImageShack, etc. 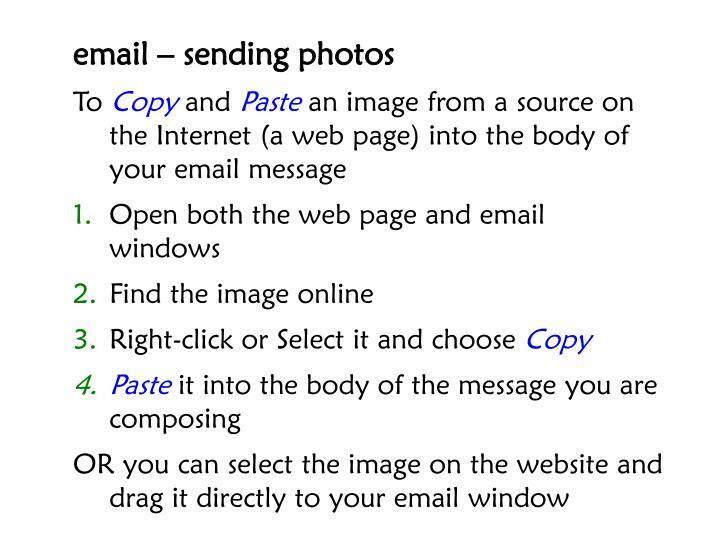 ), you can Copy and Paste those photos into your email messages. 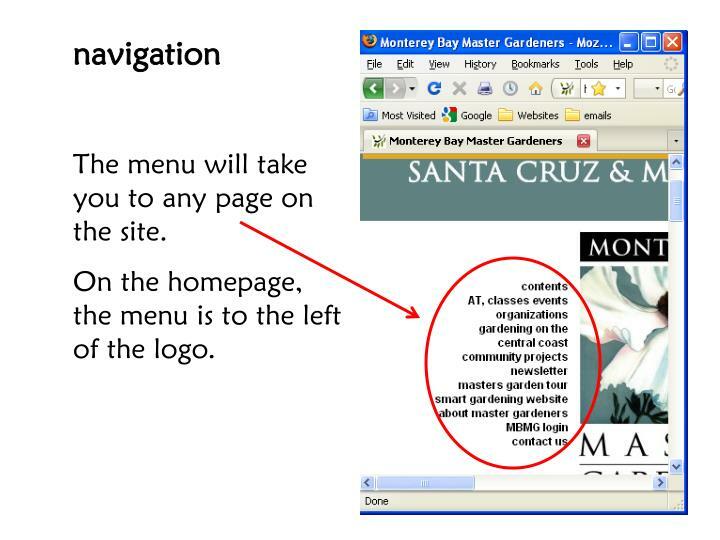 The menu will take you to any page on the site. 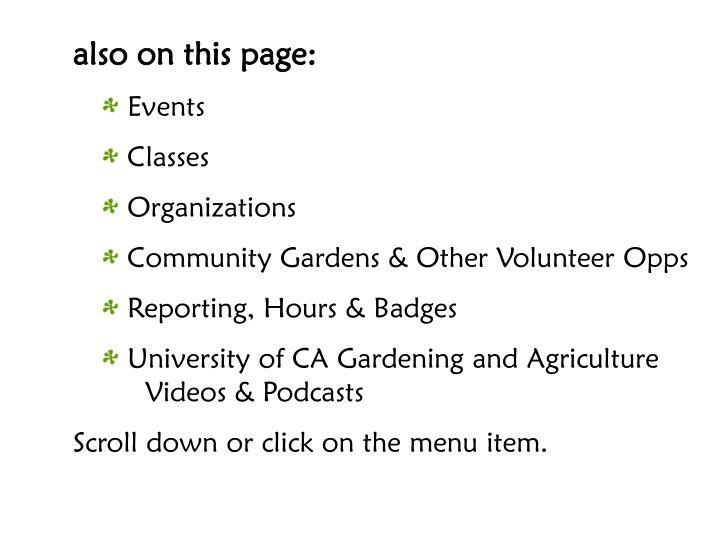 On the homepage, the menu is to the left of the logo. 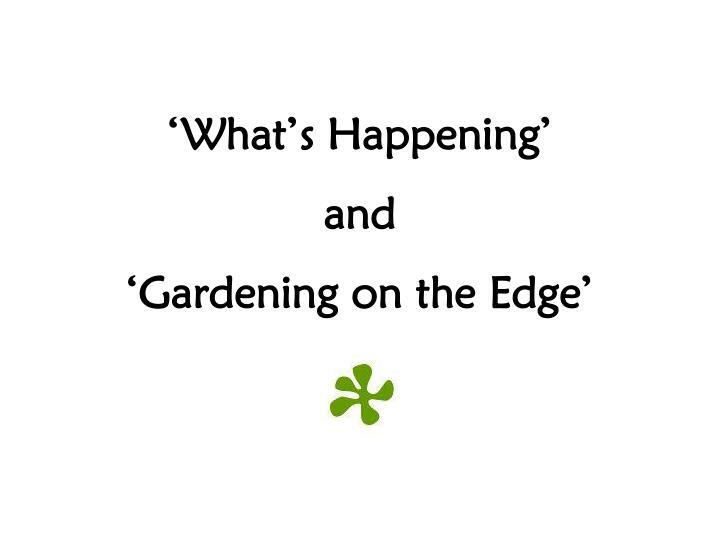 On all the other pages, the menu is at the top just under the title. 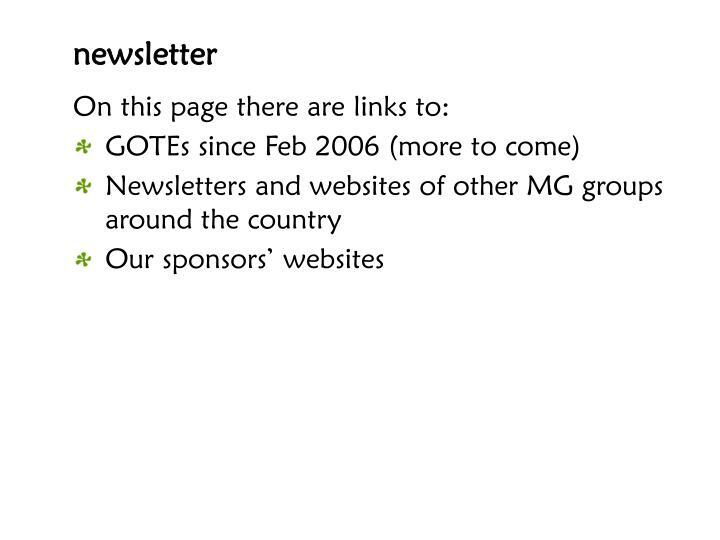 These ‘buttons’ at the bottom of the page will open sites that might be of interest. Scroll down or click on the menu item. 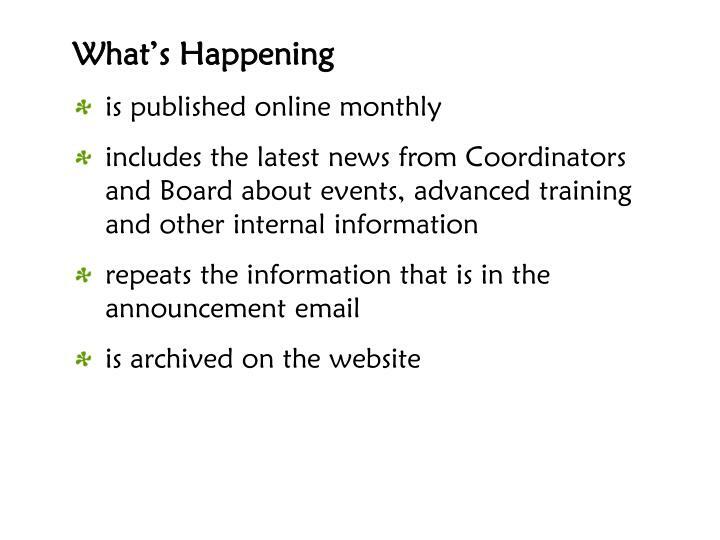 Start here to see what has been added or updated. 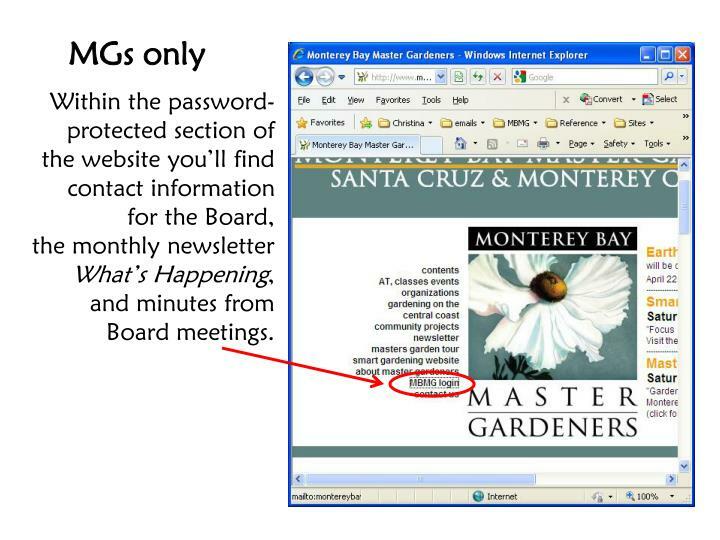 Within the password-protected section of the website you’ll find contact information for the Board, the monthly newsletter What’s Happening, and minutes from Board meetings. They look the same on the screen and on paper. Files are compressed so they load relatively quickly. 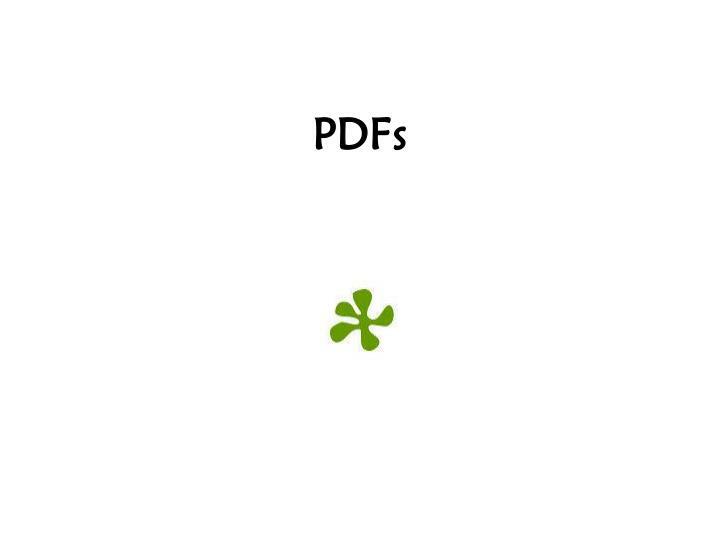 Both our publications are available as PDFs. 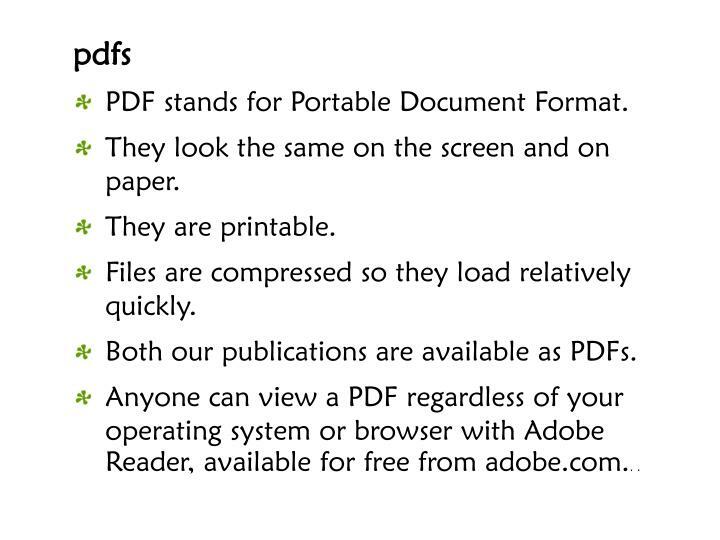 Anyone can view a PDF regardless of your operating system or browser with Adobe Reader, available for free from adobe.com.. . 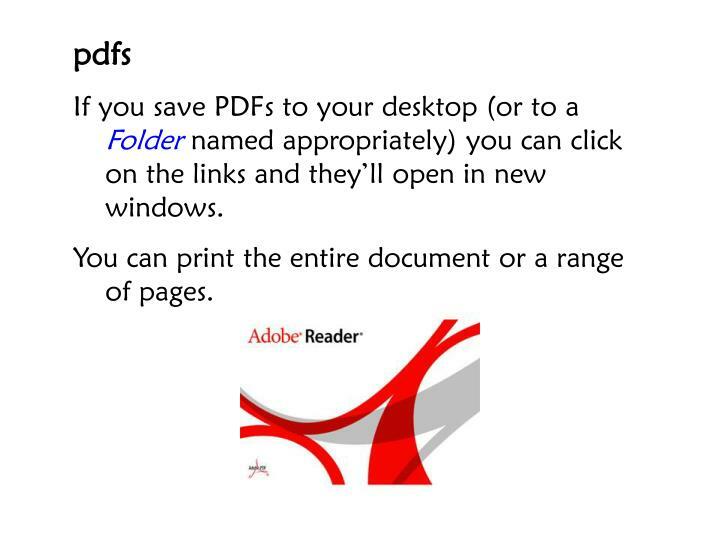 If you save PDFs to your desktop (or to a Folder named appropriately) you can click on the links and they’ll open in new windows. 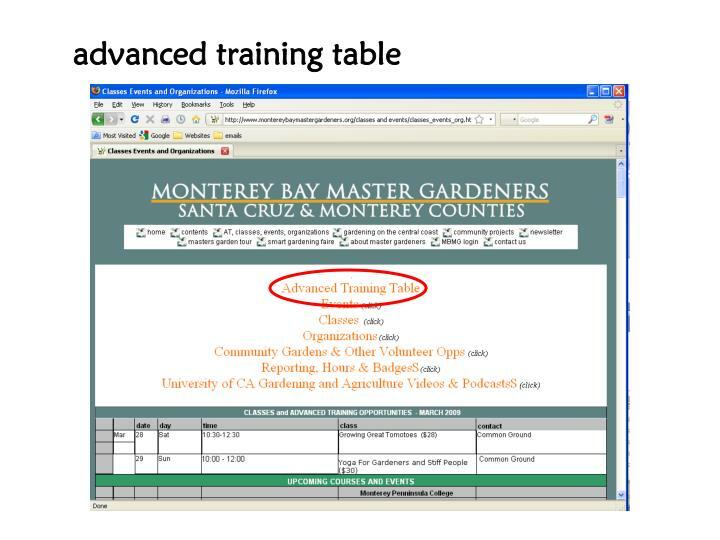 You can print the entire document or a range of pages. 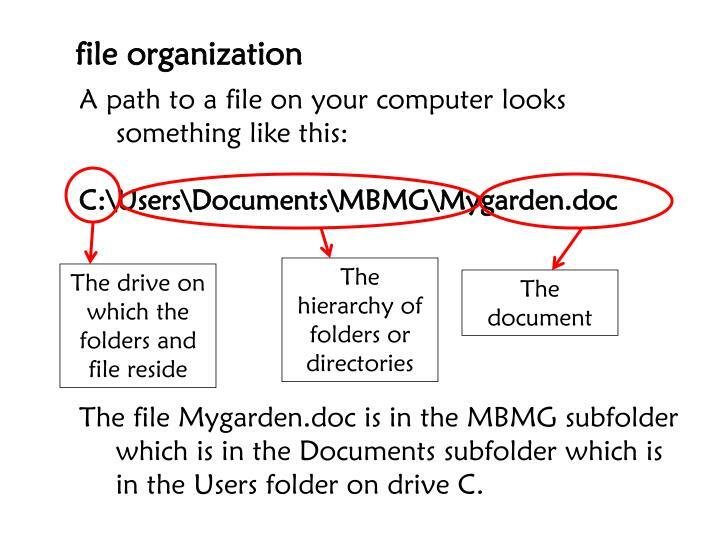 The file Mygarden.doc is in the MBMG subfolder which is in the Documents subfolder which is in the Users folder on drive C.
If you have pictures, you need a Pictures folder. 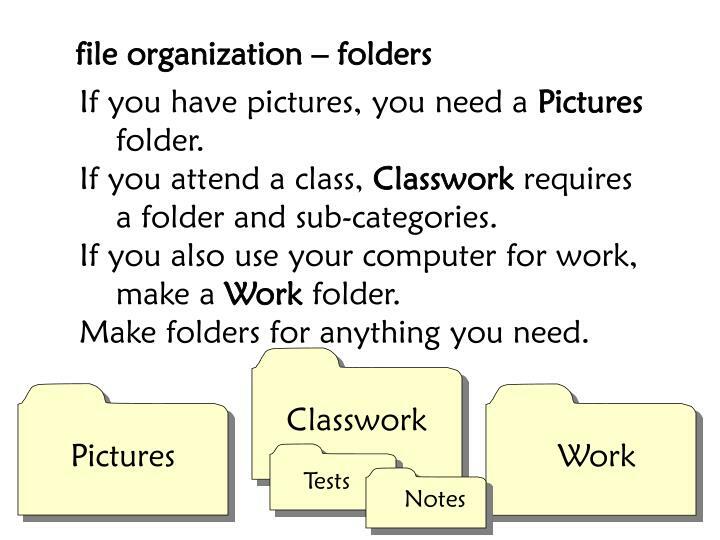 If you attend a class, Classwork requires a folder and sub-categories. If you also use your computer for work, make a Work folder. 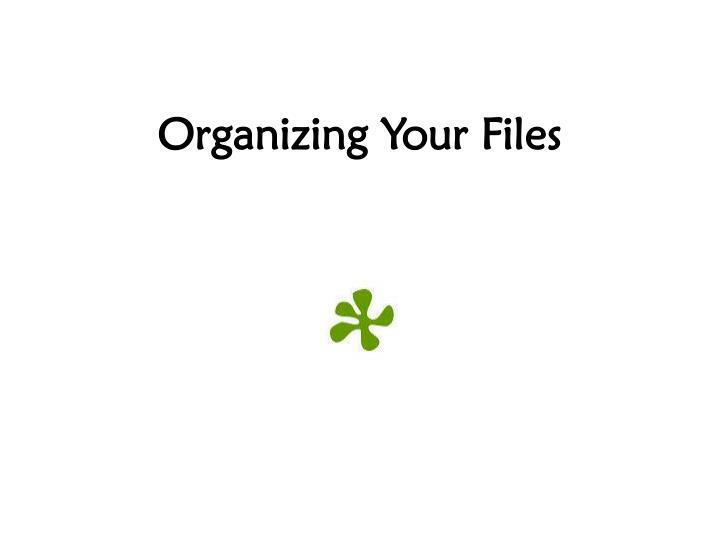 Make folders for anything you need. 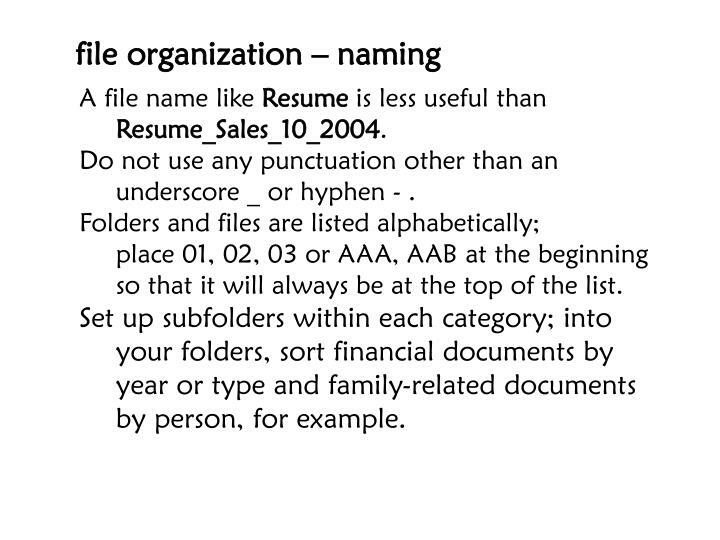 A file name like Resume is less useful than Resume_Sales_10_2004. 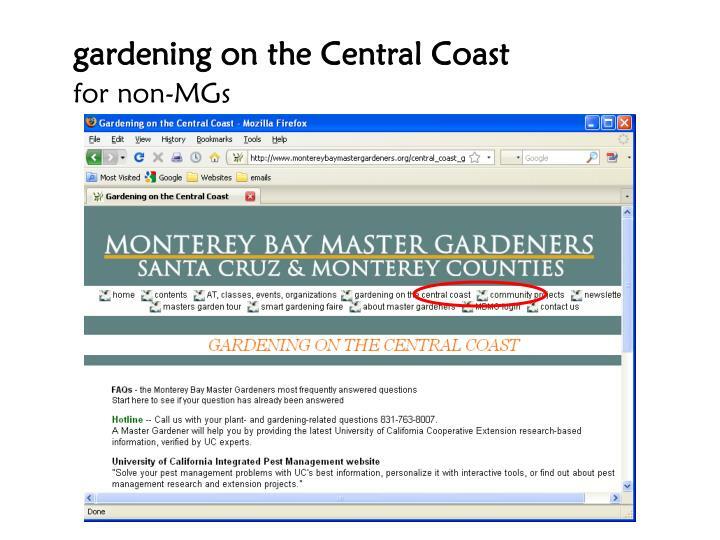 Do not use any punctuation other than an underscore _ or hyphen - . Folders and files are listed alphabetically; place 01, 02, 03 or AAA, AAB at the beginning so that it will always be at the top of the list. 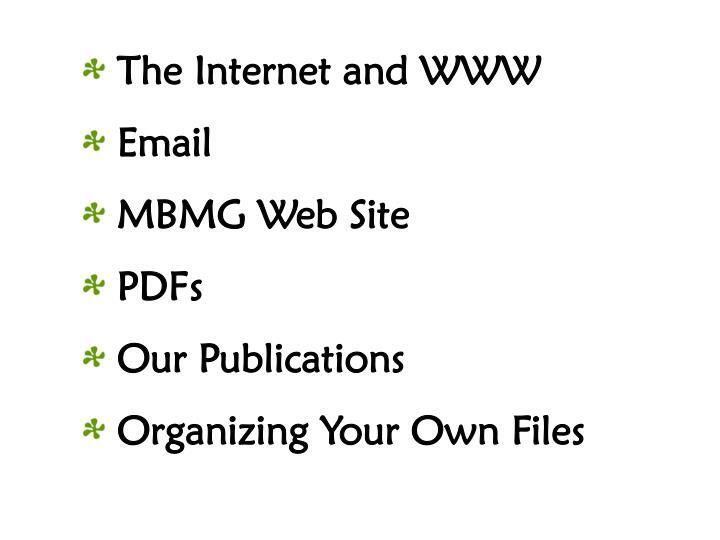 Set up subfolders within each category; into your folders, sort financial documents by year or type and family-related documents by person, for example. 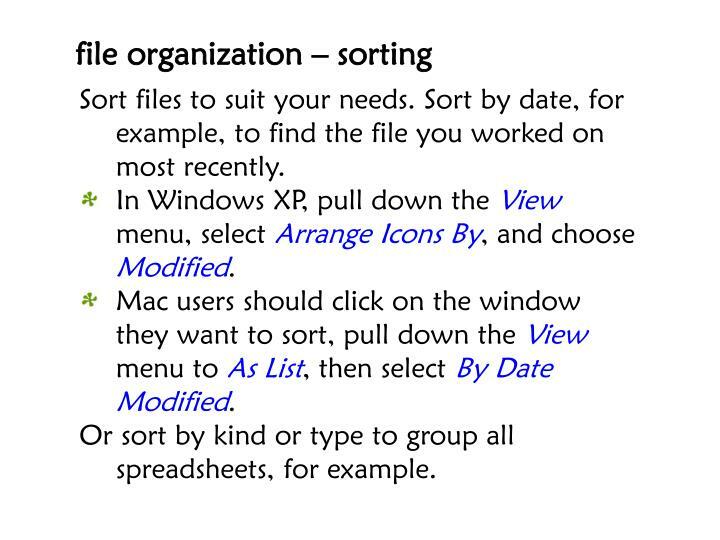 Sort files to suit your needs. Sort by date, for example, to find the file you worked on most recently. 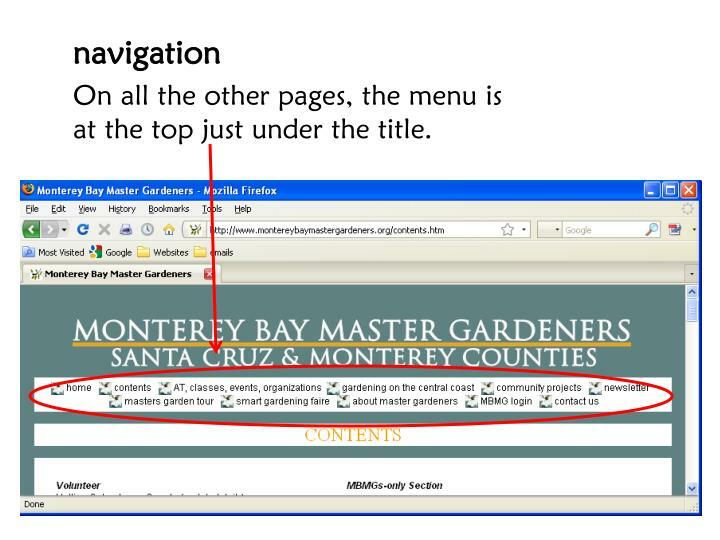 In Windows XP, pull down the View menu, select Arrange Icons By, and choose Modified. 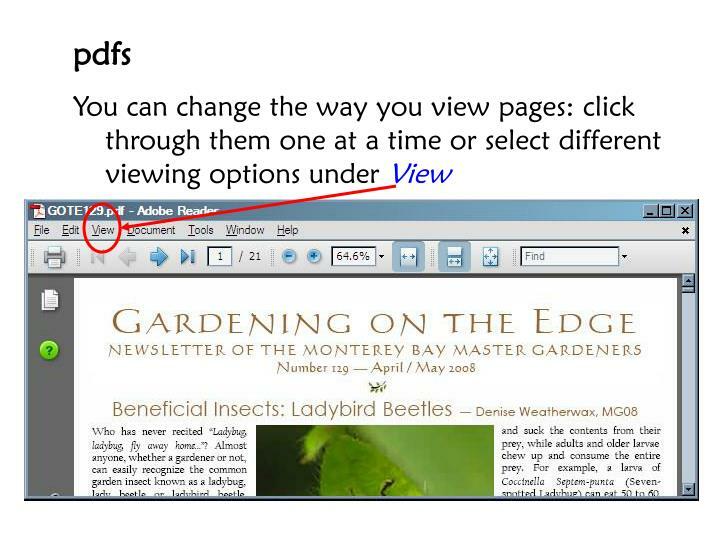 Mac users should click on the window they want to sort, pull down the View menu to As List, then select By Date Modified. Or sort by kind or type to group all spreadsheets, for example. 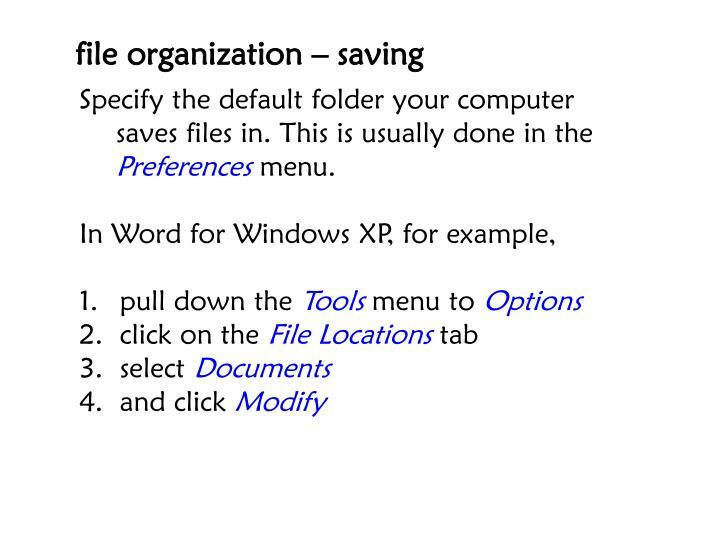 Specify the default folder your computer saves files in. This is usually done in the Preferences menu. 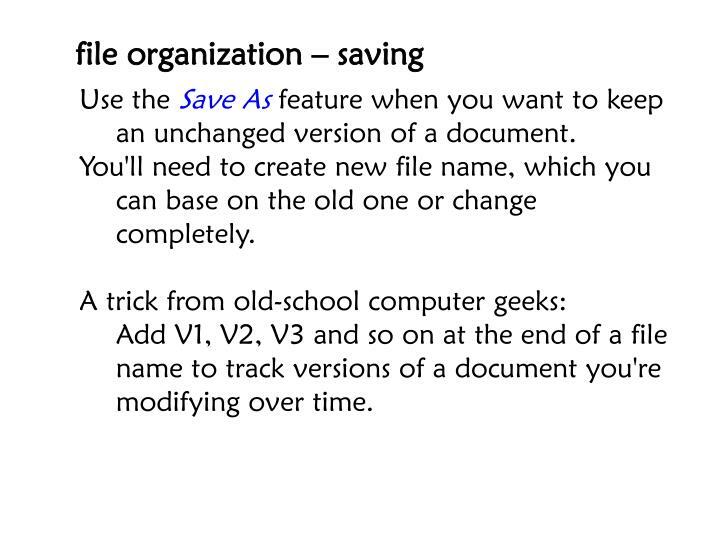 Use the Save As feature when you want to keep an unchanged version of a document. 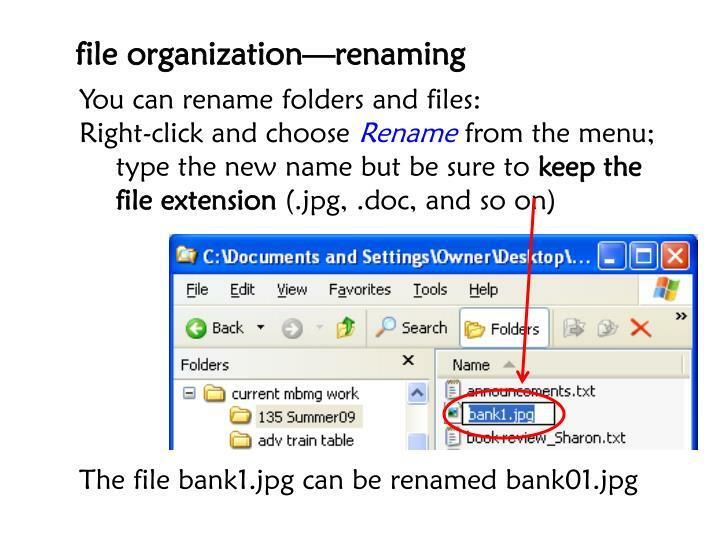 You'll need to create new file name, which you can base on the old one or change completely. Add V1, V2, V3 and so on at the end of a file name to track versions of a document you're modifying over time. 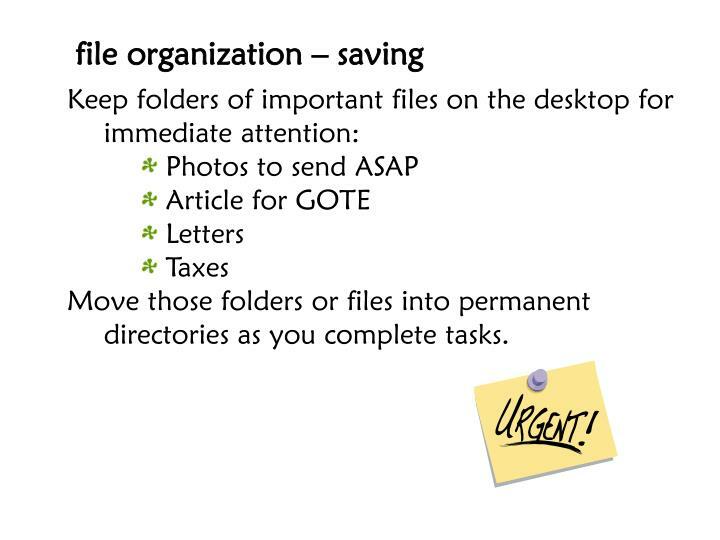 Move those folders or files into permanent directories as you complete tasks. 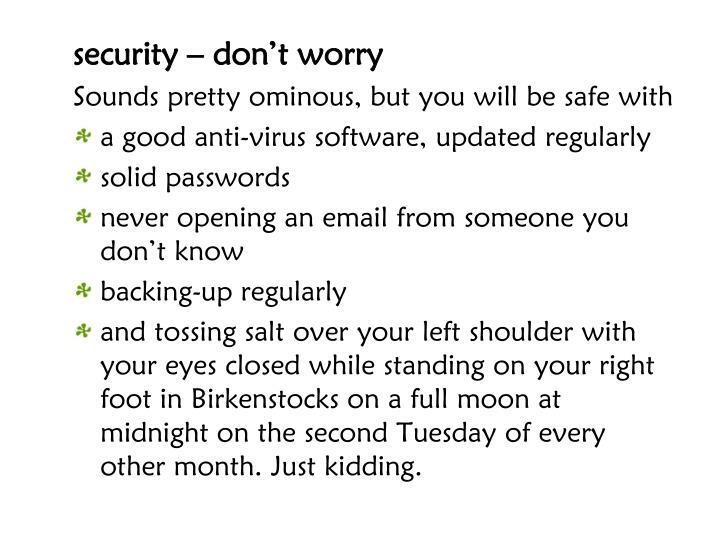 You won’t kill your computer or ruin any software by trying things out so click around and see what happens. 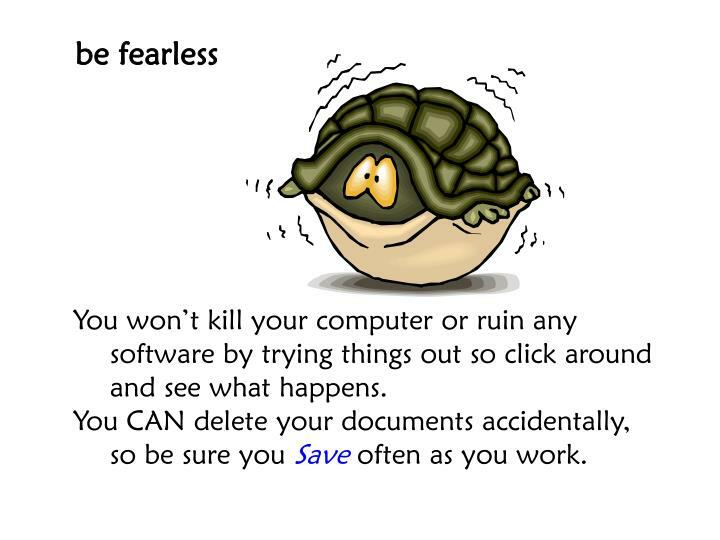 You CAN delete your documents accidentally, so be sure you Save often as you work. 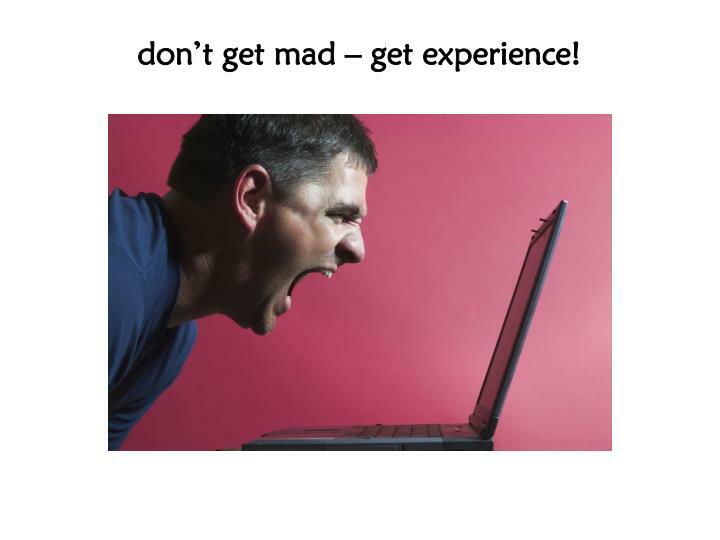 don’t get mad – get experience!